On Saturday, 24 October 2015, at the Castle Château Bela in Slovakia, members of the Sovereign Order of Saint John of Jerusalem (KMFAP), Knights of Malta, gathered and held a solemn ceremony for the award of the Agreement on Cooperation of this Order with Diplomatic Mission for Peace and Prosperity (DMPP), Tirana Headquarters. The relevant document was signed at the protocol ceremony from Jose M. Cosmelli Prince, Grand Master of KGC and Dr. Shefki Hysa, Governor of DMPP. Members of the Sovereign Order in this ceremony accepted unanimously as member Dr. Shefki Hysa, Governor of Diplomatic Mission, Peace and Prosperity, who was honored with the Highest Order by the Prince of Malta and the title of Knight of Malta. 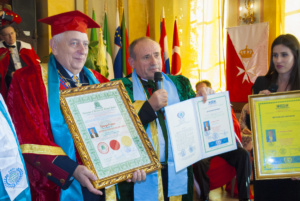 Diplomatic Mission Peace and Prosperity also conferred to His Excellency Sir George Popper the title Honorary Ambassador, High Commissioner for World Peace and the Honoris Cause Doctorate in International Diplomacy on behalf of Academy of Universal Global Peace. In this ceremony was honored by Diplomatic Mission Peace and Prosperity also Sir Tamas Szalai with the title Honorary Consul of DMPP.